Photos by Liz Martiniak © Liz Martiniak 2002; all rights reserved. Left: The good gelding Prairie Bayou. Right: Royal Glint. LONGFIELD FARM, near Goshen, Kentucky, is owned by the Lavin family. 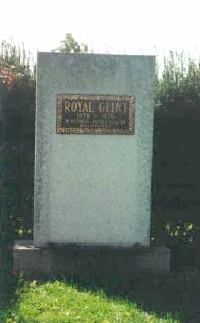 ROYAL GLINT (1970 g. by Round Table), a top turf gelding and earner of over a million dollars in purse money was owned by Dan Lassiter, and was buried here after his early death. 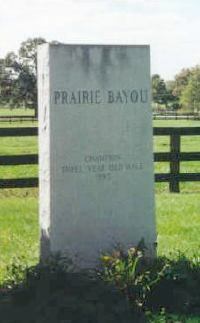 Loblolly Stable boarded horses here, and sent the gelded three-year-old champion and Preakness Stakes winner, PRAIRIE BAYOU (1990 g. by Little Missouri), here for burial when he was destroyed after fracturing his leg during the running of the Belmont Stakes.